Slow down: We all know the feeling—”just get through it. And if I talk a mile a minute, I’ll be done faster.” That’s how I attack almost every presentation. The 5-minute presentation that I perfectly practiced to my pretend audience in my dorm room would instantly turn to two minutes the second I stood in front of the class. I eventually learned that slowing down and letting myself breathe and think as I spoke would allow me to consider what I was going to say, instead of just spitting out a bunch of gibberish. Make eye contact: Reference materials/notes can be helpful when giving a presentation, but speaker beware: do not ever read word for word off from your reference documents, and do not stare at your feet–nothing makes you look more unprepared. And remember making eye contact with your audience, and finding a way for them to relate to you and what your saying is key. Think of your audience as your closest colleagues or friends and that you’re engaged in a normal conversation with them. What might you say to them to keep their attention? Tell a story, give an example, share a pun, ask them a question. All good ideas. My public speaking professor drilled home that if you are really struggling to make eye contact with your audience, find three spaces in the room to focus your eyes (wall space to your right, to your left and the back wall will do nicely). At a minimum, this gives the illusion that you are making eye contact. ALWAYS practice and prepare: Practice makes perfect (and don’t forget to watch your speed by timing your practice sessions). The more you practice your speech, the more prepared and less nervous you will be. Confidence is key to make your audience feel as if you truly know your topic. And you better know your topic. Do your due diligence and research in advance. It pays off. Know your audience: If you know your audience has a good sense of humor, throw in funny elements in your speech. If you sense folks are glazed over, staring at the floor, checking their phone, etc. find a way to grab their attention back. Walking around the room in between tables or aisles helps keep your audience on their feet and listening. Anticipate questions from your audience in advance and answer their questions in your presentation, before they even have a chance to ask. Share material that is relevant to what they care about (the company, their job, their career, their future, etc.) Knowing who you are talking to is important so you convey the right message in the right way. Last but definitely not least, relax: It is so easy to get anxious and jittery before giving a speech in front of a group. But by allowing yourself to sit back, relax and take a few deep breaths to let your nervousness ebb and you can focus on the task at hand: engaging your audience on a relevant topic. Few people look forward to presenting in public, and the ones that do are often seasoned professionals or leaders. 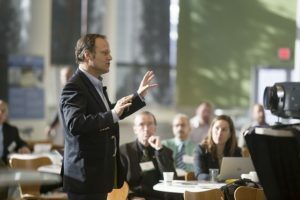 Admittedly it is nerve-wracking, but if you keep these 5 short tips on mind, your next presentation should be rewarding for both you and your audience.